That’s the motto for the Etc. Family. 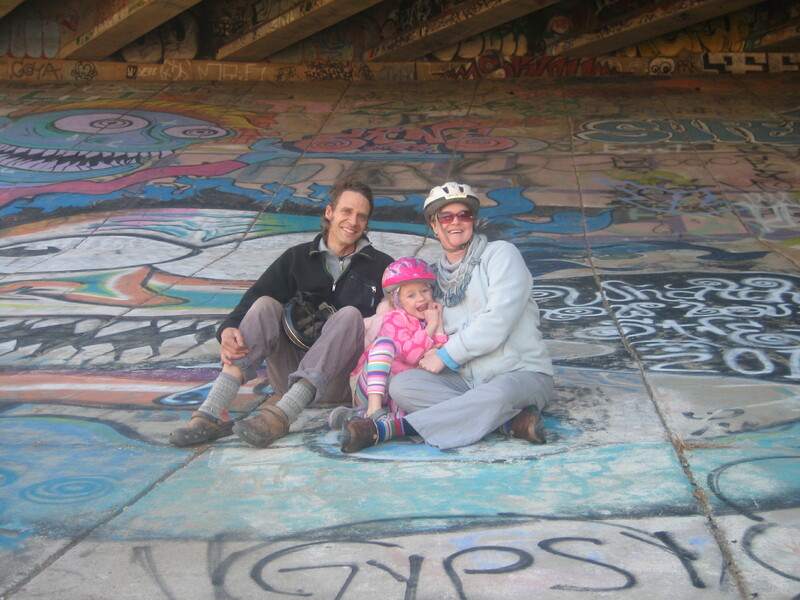 Our family outings almost always include our bikes, and those bikes make each trip affordable and memorable. We save money because we spend the majority of our time pedaling around, and seeing the world from the seat of a bicycle means you see lots of things you might not have noticed otherwise. Biking is so fun when Dad does the hard work! 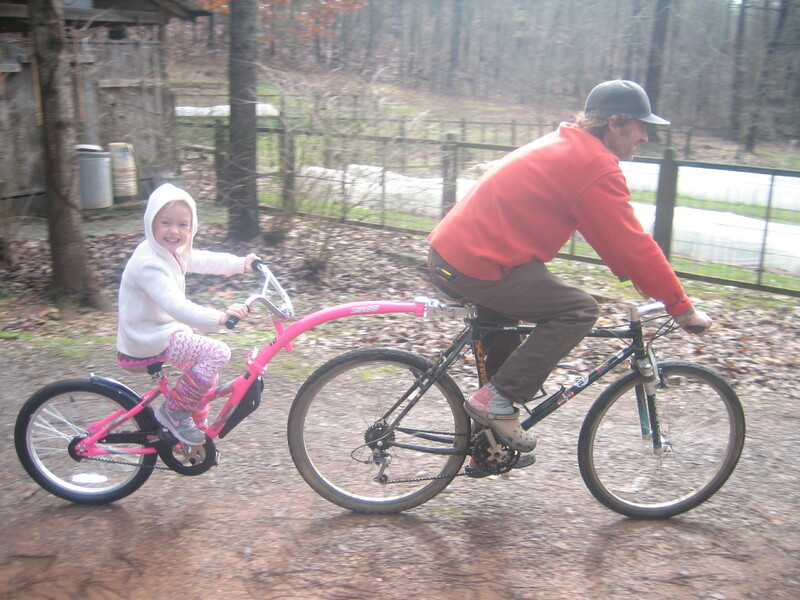 It’s called a trailer bike and, if you’re a parent who likes to ride, it has the power to change your life. It has definitely changed ours. Thanks to Santa for bringing it last Christmas (wink, wink). The smart little contraption attaches to the adult bike’s seat post and allows the little one to pedal and steer but not really affect the ride other than the added weight and balance challenges. 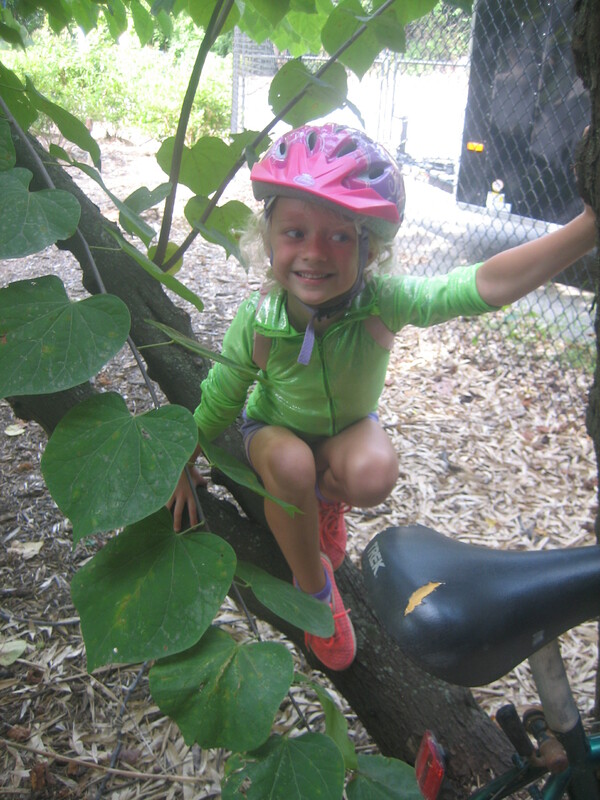 Their literature also says that kids who use a trailer bike have been known to learn to ride on their own faster, because they get to experience the sense of balance and motion necessary to keep a bike upright. If that’s true, it is simply gravy to us, because the real benefit is that we can all go riding as a family so much more easily. And L’Oiseau does contribute to the pedaling somewhat, so it’s easier on the adult than a simple “pull-behind” cart would be. We also had a great time riding on the Athens Greenway, but failed to get photos. Bad blogger! Bad, bad blogger! A trailer bike does take a little effort to get comfortable piloting. You may have noticed that all the action shots show L’Homme riding with L’Oiseau on the back. I have only clocked about 15 minutes with the trailer behind my bike, because, well, truthfully, L’Homme is happy to be the pilot of the bicycle-built-for-one-and-a-half, so I take the easy road and just pedal alongside them. According to my darling husband, the balance and turning radius is definitely affected, so it takes some getting used to, but it’s certainly doable and so worth it for affordable family fun. P.S. For those who want details, the trailer bike we purchased is from a German company called Weeride. IMHO, it was very affordable: we paid $89 to get it from Amazon, and it took only some very basic assembly. L’Oiseau has ridden on it at least 20 times in the past 8 months, and it shows no signs of wear. Soooooo worth it! 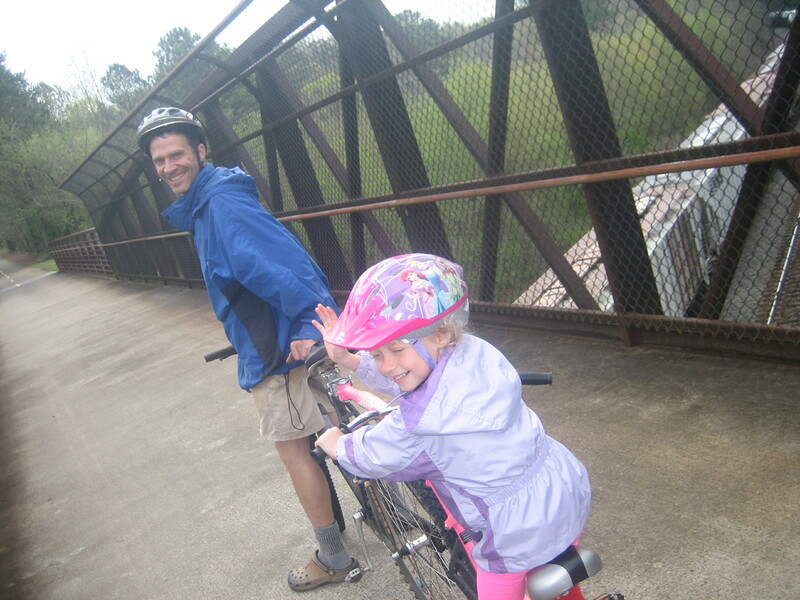 This entry was posted in Parenting, Travel and tagged Athens Greenway, Atlanta, Atlanta Beltline, bicycle built for two, bicycling, biking, Chattanooga, family, family vacation, Riverwalk, Silver Comet Trail, trailer bike, travel, Weeride.